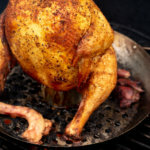 Our family can’t get enough of this Beer Can Chicken! This is the “go-to” grilled chicken recipe in our house. You know when you find that one recipe that turns out amazing every single time you make it? 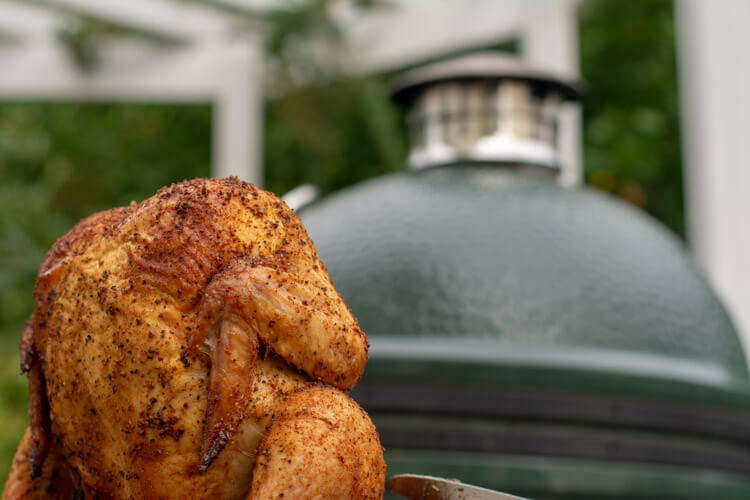 That is how this Beer Can Chicken on the Big Green Egg recipe is for our family. We started with a mild grilling rub recipe from a grilling book many moons ago and have adapted it to our tastes. Each mix of the rub makes enough for 2-3 batches of Beer Can Chicken. The chicken is so tender and moist. Even the white meat (which is so easy to dry out) stays nice and juicy. There is a lot of great information on this recipe so don’t stop reading now! We use a traditional Beer Can Chicken pan that has the container in the center of the pan used to hold the beer. A separate conical shaped piece slips in to help to hold the chicken upright. But don’t worry if you do not have this pan. You can just use a (opened) can of beer to hold the chicken upright. If you do this, I recommend placing it on a small disposable pan to catch the drippings. 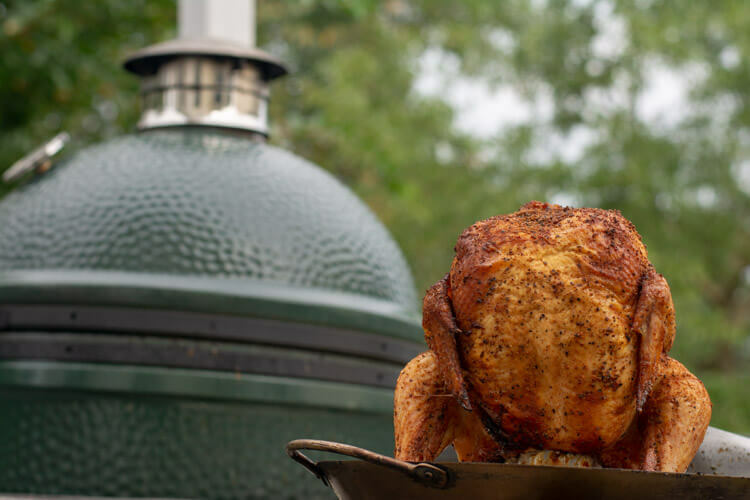 If you are making this for a large event, you can place 3-4 whole chickens on individual cans on the Large Big Green Egg. The Beer Can Chicken pan is large enough (but not too big!) that we are able to cut up carrots and onions to put around the base of the chicken for additional flavor. 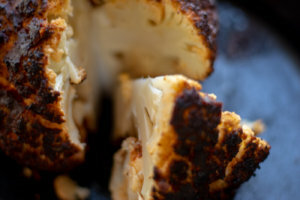 I typically add these in the last 20-30 minutes, otherwise they can easily become overcooked. I wonder how many other BGE’ers grill multiple meals at a time for the week like we do or are we just crazy? Since it takes a little bit of time to warm up the Egg, we just make a few days worth of meals. Maybe that is another reason this recipe works so well for us? We often make it as a quick add-on to the other things we are grilling at the time and use it for Jason’s work lunches. Not only is the food delicious but it is a daily reminder of the fun grilling weekend! Everyone always asks about the beer that we use and does it matter? Of course, it does. It’s best to use a beer that you love. Just like a deep, dark Guiness stout tastes different than a light Belgian Ale, they will add a different flavor to the chicken as well. Play with it and see what you prefer. If you don’t normally buy beer, then it’s best to start with a Pale Ale, Belgian Ale or Sam Adams. I set up the grill using direct heat (remove the plate setter). Bring the temperature up to 350 degrees and you will be ready to go. I like to give the BGE a few extra minutes to heat up and wait for the white smoke to turn silvery. That is when I know the grill is ready. 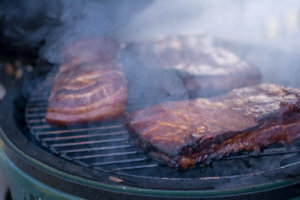 Place the pan with the beer and the rubbed chicken in the center of the grill, close the lid and monitor the temperature to keep it close to 350 degrees. 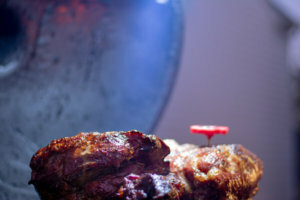 It is done when the internal temperature reaches 165 degrees. Take it off the grill and it is ready to serve. I bring lunches to work each day, and love it when I grill the whole chicken on the weekend. I know I will get lunches throughout the week with this fantastic juicy chicken. It is easy to pick the chicken apart and place them in individual tupperware containers with some fresh grilled vegetables, like the bacon wrapped brussel sprouts. That is oh-so good! Fun Tip: Don’t throw away the little pouch that comes with the whole roasting chicken. The chicken liver, gizzard and heart are packed full of nutrients and taste delicious! Wait until there is 20 – 30 minutes left on the grill, sprinkle them with the same seasoning that you rubbed on the chicken, and let them cook. It’s funny, but these are so darned good that they never seem to make it into my lunches for the week. What’s up with that? Place all Rub ingredients in a medium sized bowl and mix thoroughly. Break up any lumps with a whisk. 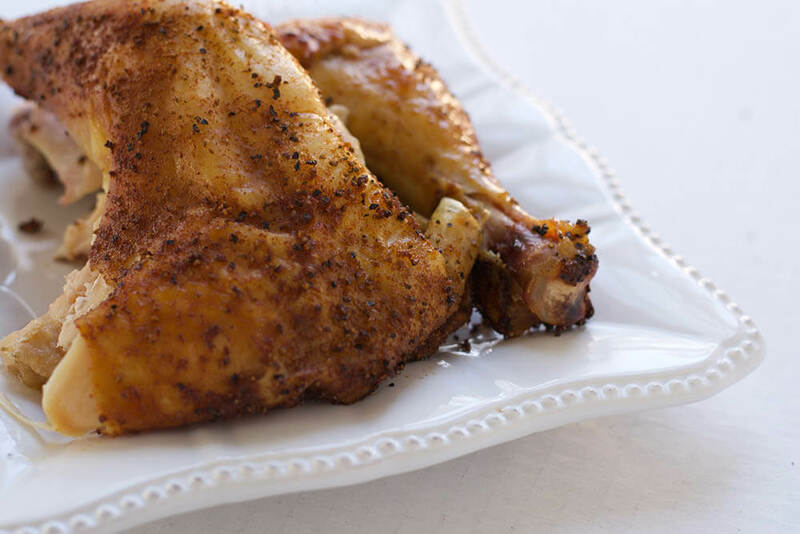 Use about ½ of the rub to liberally coat the chicken, inside and out. Note: If the skin is dry, you can rub a teaspoon of olive oil over the skin before adding the mix. The oil will help the mixture stick. Pour your favorite beer in the cup of the beer can chicken holder. 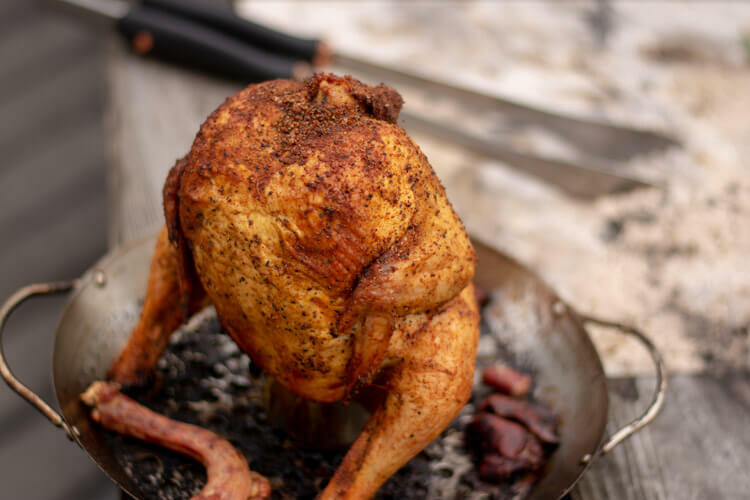 If you do not have a beer can chicken holder, we have used an open can of beer and set the chicken/beer can on a disposable grilling pan on the BGE. This is the best part! Set the BGE for direct heat and stabilize the temperature to around 350 degrees. Cook until the internal temperature reaches 165 degrees. Note: Every now and then, the grill will have a hot spot, so keep a watchful eye on it.